or 8 Mhz. operation. Memory access requirements at 4 Mhz. search memory, do inputs and outputs, and boot your disk. stepping, and execute with breakpoints. 100 mao at + 16V and at -16V. random or sequencial reading and writing to named disk files . supported are the Tarbell and Cromemco disk controllers. the much higher performance 8086. 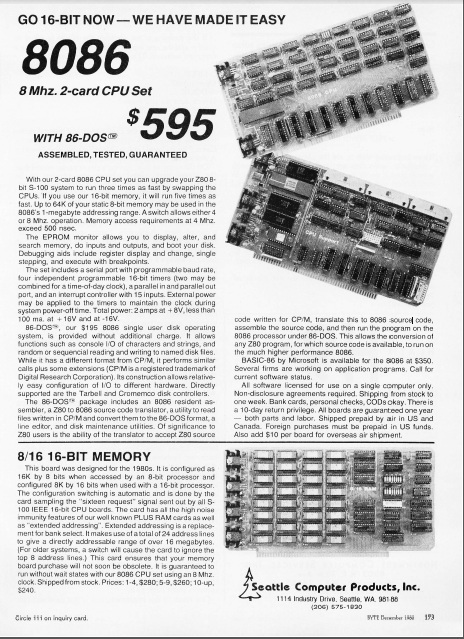 BASIC-86 by Microsoft is available for the 8086 at $350. All software licensed for use on a single computer only. Canada. Foreign purchases must be prepaid in US funds. Also add $10 per board for overseas air shipment. configured 8K by 16 bits when used with a 16-bit processor. to give a directly addressable range of over 16 megabytes. run without wait states with our 8086 CPU set using an 8 Mhz. The ad is from December of 1980, and of course the PC was released in August of 1981… Its interesting to see even back then there was some clear partnering with Microsoft! I don’t think it was me specifically but my hosting company got hit hard. Needless to say I’m finally up right now. I had a monthly backup scheme going, clearly I’ve got to get something going daily …. I’ve also found a company down the road from me that can colo for ~ $100 a month which I may jump on as I’d like to host a bunch of stuff in a semi reliable manner, and having an 8 core / 16GB machine to do it would be nice. KOTOR II finally on steam! I have no idea how it will react to mods that try to correct this rush job of a game, but it is nice that it finally got pushed out..
Anyways its $10 USD, and sadly Windows only.  I will have to try it under emulation sometime. 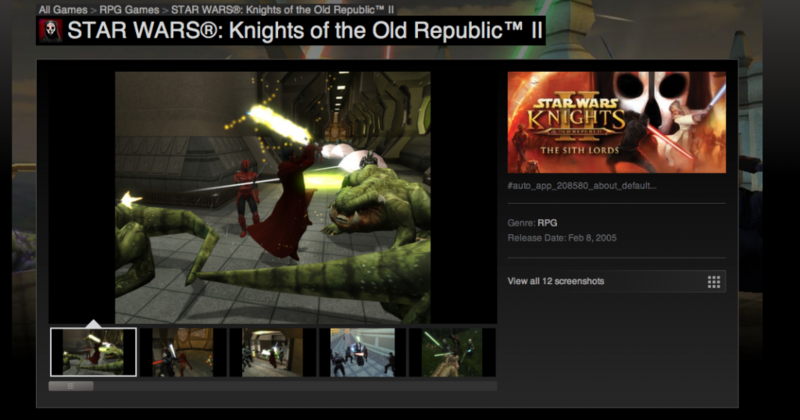 Author neozeedPosted on August 24, 2012 Categories random updatesLeave a comment on KOTOR II finally on steam! Qemu entering the 1.2 rc phase! Three new SCSI host bus adapter devices are available: am53c974 and dc390 emulate respectively an AMD PCI PCscsi and a Tekram DC-390 device, both of which are supported on older operating systems including MS DOS 6.2, MS Windows 3.11, 98 SE, NT 3.1 and NT 4.0. megasasemulated an LSI SAS1078 RAID controller. The next version of SeaBIOS will support booting from am53c974 and dc390 disks. That’s right! 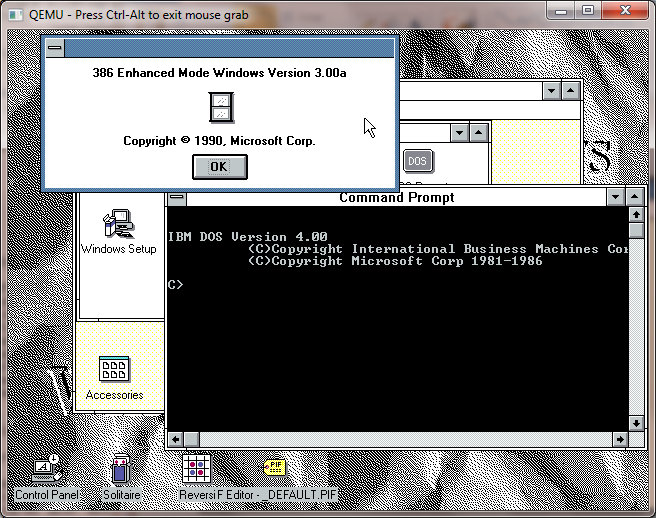 With the Tekram DC-390 you will be able to install Windows NT 3.1 with only a install floppy & CD-ROM. I also hope this includes stability fixes for Novell Netware..
I’m not too thrilled on the audio aspect, while I’ve managed to compile in Direct Sound & Fmod, fmod doesn’t produce any sound, and Direct Sound is very laggy. Another thing I don’t “get” is that inside of mingw SDL displays Qemu with a normal aspect ratio and runs fine, but copying the same binaries & DLLs out of Mingw gives me that weird and slow display.. So I’ve removed the full screen capability (did anyone use it? it never worked right anyways…) as I had done before, and it seems ok. I haven’t gotten around to looking at the new SCSI adapters or how to configure them, but I hope to do that real soon! It will be cool for sure! That said it is a *LOT* faster than 1.1.1 or 1.1.0 ! As always, my binary is here. Author neozeedPosted on August 23, 2012 Categories qemu18 Comments on Qemu entering the 1.2 rc phase! Not to shill too hard for it, but it is for sale for 10 euros, or 8 pounds sterling.. 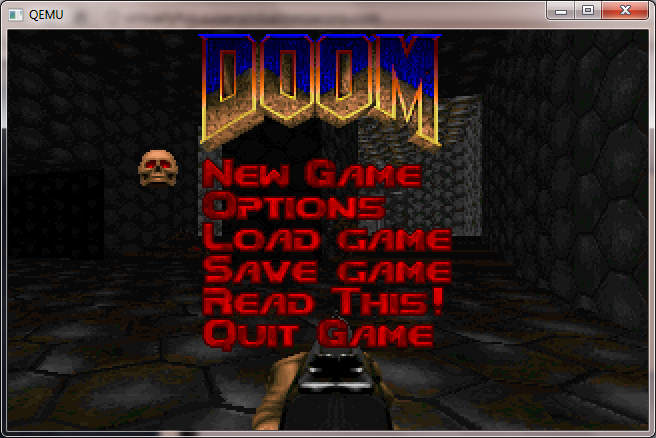 I should hope that this 1997 classic should work on modern PCs.. Which has been a pain for anyone whos owned this when it originally came out for the PC. Although as far as I can tell this doesn’t add anything from the original version … Other than some click to cheat thing but.. There you go. But in the interim the MIPS emulator in Qemu 1.1.1 has made a bunch of progress, and can install & run NT 4.0 without any issues! There is a few things to look out for, the first is that you have to specify a NVRAM image file to keep it persistant across instances. And you need to ‘expand’ it beyond the definition size to get things like the MAC address to be stored. And by default the Qemu MAC address to configure within the Magnum BIOS is 525400123456 ..
I’ve been able to download & install Internet Explorer 3, and Quake World.. And even connect up to quake.xs4all.nl and it worked! One thing I’d advise is to copy the directory OS\WINNT40 on the system partition to OS\NT to make it that much easier to re-add the boot statement, if you have to go down that road. As always, special thanks to Hervé Poussineau for making all of this possible. Next I’ll have to investigate better audio libraries, as winwave seems to leave a lot to be desired. 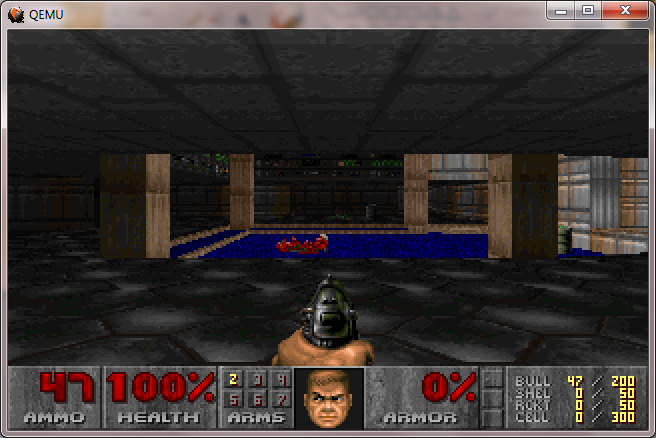 So now it keeps the correct video display size, so it isn’t going like crazy trying to scale the screen 30 times a second..
As you can see stuff like Doom now looks normal. As mode changes are initiated by the video card, it keeps the scale to where it was in prior versions. At least its not going 1:1 native as looking at a 320×200 window on a 1280×768 desk would be a tad hard..
I’ve been told the new handling of disks is better in this version so I’ve left this setting where it was.. I have just updated the download link, but for those who missed it, you can download the i386 win32 version here.